It all began last week when a few local restaurants started to offer discounted meals (50% Off) to federal employees and their families affected by the government shutdown. But then it grew to even more than that, where a few citizens (among them, Councilman Warren Harhay) wanted to ‘Pay it Forward’ and do a little more. Some have made recommendations – contribute to local non-profit organizations equipped to help those in need, or even pick up the tab on a meal (or donate a gift certificate). And the gesture grew like a tidal wave on social media. So, we’ve rounded up what we can to list out who is doing what in town to help. We’re not able to say this is 100% complete, but it’s what we’ve gathered so far. Note: these offers will last only as long as the shutdown remains. Employees furloughed who wish to take advantage of any of these offers, should be prepared to show ID and speak to the appropriate owners/departments within each business. Southwest Dinner: 50% Off for all Government Employees affected by the government shut-down. 761 Nevada Way. Vinny’s Pizza: 50% Off for all Government Employees affected by the government shut-down. 1632 Boulder City Parkway. Rail Explorers: FREE rides to furloughed Federal Employees and their families during the government shut down. To make reservations (requested in advance) call 877-833-8588. 601 Yucca Street. Creative Salon: 25% Off all salon services to employees and their children. 1001 Nevada Way, Suite B. Auto Specialists: Custom discounts can be arranged – see owner Lee for pricing. 705 Juniper Way. Hoover Dam Lodge: Free Breakfast & Free Bingo’ to furloughed government employees. The offer includes a classic breakfast or short stack breakfast at the Bighorn Café and a FREE Bingo ‘blue pack’ to play any session on that day. The idea with bingo is to add a little entertainment as well. Anyone wishing to receive this offer will need to go to the Players club at Hoover Dam Lodge and obtain a voucher, which is good for that day. 18000 US Hwy. 93. Ruben’s Woodcraft and Toys: Free painting and ‘slime making’ for the children of furloughed employees. 555 Hotel Plaza. Bloom: If you would like to dabble in the amazing world of Annie Sloan Chalk Paint® during the govt shutdown…. get started with a sample pot at half off! Its a great way to experiment with the best paint in the world with little to no prep work. For all of you govt workers with a little free time on your hands and a tight budget, be sure to give us a call at 702-294-1010 and we will add you to the list for a Free Introductory Workshop at Bloom. We will call you back with a date once we have more information. Hottest Dam Boutique: 20% Off all merchandise. (Some exclusions may apply) 501 Nevada Way. Tom Devlin’s Monster Museum: 50% Off Admission to the museum. Boulder Dam Credit Union: They are willing to be flexible with any furloughed employee having difficulty keeping up with their loan payments. This is on a case-by-case basis, so contact the Credit Union directly or your loan officer. 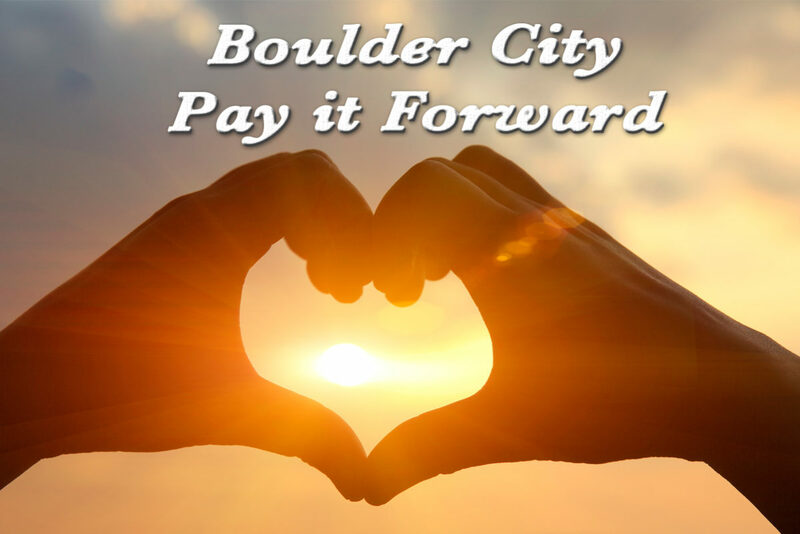 530 Avenue G.
The City of Boulder City: Furloughed employees who may be struggling to make owed payments to the City should contact them directly for possible assistance on a case-by-case basis. City Hall, 449 California Avenue. Emergency Aid of Boulder City, along with Lend a Hand and the Christian Center Church Food Bank are all well aware of the need. They emphasize they are here to help in any way, should it be relief for food or other services. Contact any of these organizations if you are among those furloughed employees, or know someone who is in need of assistance. And lastly, if you’re not among these workers who are either not allowed to work, or have to work without pay, then it’s a great time to pull out the checkbook and give what you can to any of the above agencies. We are all so privileged to call Boulder City home, and we think what has happened here, the spontaneous uprising of support, is fantastic!